U.S. President Barack Obama’s capstone to his Presidency, his proposed megalithic international ‘trade’ treaties, are finally coming into their home-stretch, with the Pacific deal finally being made public on Thursday November 5th. The final Trans-Pacific Partnership (TPP) proposed treaty would leave each signatory nation liable to be sued by any international corporation that objects to any new regulation, or increase in regulation, regarding climate change, otherwise known as global warming. In no terminology is that phenomenon even so much as just mentioned in the “Environment” chapter. Throughout, the treaty would place international corporations in ever-increasing control over all regulations regarding workers’ rights, the environment, product safety, and consumer protection. But the environmental and labor sections are particularly blatant insults to the public — a craven homage to the top stockholders in international corporations. The world’s richest 80 people own the same amount of wealth as the world’s bottom 50%; and Obama represents those and other super-rich and their friends and servants in the lobbying and other associated industries. But he also represents the even richer people who aren’t even on that list, such as King Salman of Saudi Arabia, the world’s richest person. 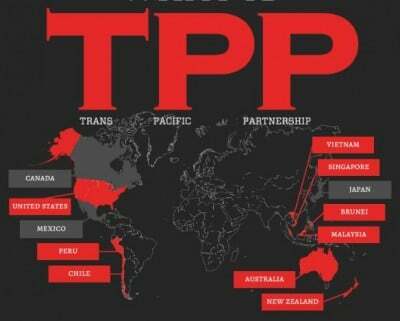 It’s people such as that who will be the real beneficiaries of Obama’s ‘trade’ treaties. The public will beharmed, enormously, wherever these treaties become law. The full meaning of the terms that are set forth in the TPP agreement won’t be publicly known for at least four years, but the explicit terms that were made public on November 5th, and that will be presented to the 12 participating nations for signing, are entirely consistent with what had been expected on the basis of wikileaks and other earlier published information. 6 nations that Obama had invited into the TPP were ultimately unwilling to accept Obama’s terms and so were excluded when the final text was published: Colombia, Philippines, Thailand, Taiwan, South Korea, and Indonesia. The phrases “global warming” and “climate change” don’t appear anywhere in the entire TPP document, nor does “climate” nor “warming” — it’s an area that’s entirely left to international corporations in each one of the separate participating nations to assault as much as they wish in order to gain competitive advantage against all of the other corporations that operate in the given nation: i.e., something for each corporation to sacrifice in order to be able to lower the given company’s costs. That raises its profit-margin. This also means that if any international corporation claims to be subjected in any participating nation, to global-warming regulation or enforcement which poses a barrier or impediment to that corporation’s profits, then that corporation may sue that given nation, and fines might be assessed against that nation (i.e., against its taxpayers) for such regulation or enforcement. National publics are no longer sovereign. In other words: This is, and will be, the low level of the playing-field that U.S. workers will be competing against in TPP etc., just as it is already, in the far-smaller existing NAFTA (which Hillary Clinton had helped to pass in Congress during the early 1990s). (Bill Clinton, Hillary Clinton, and Barack Obama, all campaigned for the Presidency by attacking Republicans for pushing such ‘trade’ deals. Their actions when they gain power, contradict their words. America and virtually the entire world has become rule of a suckered public, by perhaps as many as a thousand psychopathic aristocrats who own the international corporations and ‘news’ media, and who regularly do business with each other though they wall themselves off from the public. That U.S. Trade Representative, Michael Froman, is the same person Obama has negotiating with foreign governments, and with international corporations, both Obama’s TPP, and his TTIP & TISA. The most important chapter in the TPP treaty is “Dispute Settlement,” which sets forth the means by which corporations will sue countries for alleged violations of their stockholders ‘rights’ to extract profits from operations of those corporations in the signatory countries. The underlying assuption here is that the rights of international stockholders take precedence over the rights (even over the sovereignty rights) of the citizens of any participating country. Article 28.10.3 says that anyone who possesses “expertise or experience in law, international trade, other matters covered by this Agreement, or the resolution of disputes arising under international trade agreements” may be selected for the roster, so long as the individual meets vague criteria such as that they “be independent of, and not be affiliated with or take instructions from, any Party.” No penalty is laid out for anyone on the roster who lies about any of that. Basically, anyone may become a person on the roster, even non-lawyers may, and even corrupt individuals may, especially because there are no penalties for anyone on the roster, none at all is stated. There is no appeals-process. If a nation gets fined and yet believes that something was wrong with the panel’s decision, there is no recourse. No matter how much a particular decision might happen to have been arrived at in contradiction of that nation’s laws and courts and legal precedents, the panels’ decisions aren’t appealable in any national legal system. Whatever precedents might become established from these panels’ subsequent record of decisions will constitute no part of any nation’s legal system, but instead create an entirely new forming body of case-law in an evolving international government which consists of international corporations and their panelists, and of whatever other panelists are acceptable to those corporate panelists. Voters have no representation, they’re merely sued. Stockholders have representation, they do the suing, of the various nations’ taxpayers, for ‘violating’ the ‘rights’ of stockholders. The roster of authorized panelists available to be chosen by any corporation’s panelists in conjunction with by any nation’s panelists, is customarily composed of individuals who move back and forth between government and private-sector roles, through a “revolving door,” so that on both ends of that, the ultimate control is with the owners of the controlling blocs of stock in various international corporations. This is the newly evolving world government. It will not block any nation from legislating protections of workers, or of consumers, or of the environment; it will simply hold a power to extract from any participating nation’s taxpayers fines for ‘violating’ the ‘rights’ of stockholders in international corporations. Citizens will increasingly be held under the axe, and the top stockholders in international corporations will be holding it. This isn’t the type of world government that was anticipated by Franklin Delano Roosevelt, Albert Einstein, the founders of the U.N., and by the other early (pre-1954) proponents of world government. But, since 1954, the plans for this anti-democratic form of emerging world government were laid; and, now, those plans are the ones that are being placed into effect. In his fourth report to the UN General Assembly, Mr. de Zayas focuses on the adverse human rights impacts of free trade and investment agreements and calls for the abolition of Investor-State dispute settlement mechanism (ISDS) that accompanies most of these agreements. “Over the past twenty-five years bilateral international treaties and free trade agreements with investor-state-dispute-settlement have adversely impacted the international order and undermined fundamental principles of the UN, State sovereignty, democracy and the rule of law. It prompts moral vertigo in the unbiased observer,” he noted. Far from contributing to human rights and development, ISDS has compromised the State’s regulatory functions and resulted in growing inequality among States and within them,” the expert stated. De Zayas was quoted in Britain’s Guardian on May 4th as saying also that, “The bottom line is that these agreements must be revised, modified or terminated,”because they would vastly harm publics everywhere, even though they would enormously benefit the top executives of corporations by giving them control as a sort of corporate-imposed world government, answerable to the people who control those corporations.